Uncollected pledges, if paid, could bring the total amount pledged to $4365.00. All other contributions from organizations, including the Charity Ball and raffle, bring the net total to $5774.21. At a meeting held on Wednesday evening, 3 December, at the home of the chairman, the United Charities Drive committee members completed an audit of all funds collected and determined the amounts to be donated to the respective charities and welfare organizations from the general fund. Plans were announced by Stretch Schneider this week covering the 1954 United Charities Drive. The outgoing Chairman said the first order of business would be the selection of a new committee. Tentative plans call for the drive to begin not later than September 28, and continue through November 13. The purpose of one United Drive each year, according to the Chairman, was to permit depot residents to give all their favorite charities at one time, rather than be bothered by individual drives throughout the entire fall and winter months. As in the past the committee will be composed of depot employees who represent their various divisions. "The drive is big business," Stretch Schneider said "There is a great deal of work to be done on the individuals own time." He urged that in naming members to the committee, employees would insure those selected would have the time and had expressed willingness to serve. "The importance of securing civic minded workers is a prime requisite of a successful year." Schneider said, "because the members must continue on throughout the entire year as members of the Community Chest." The Community Chest during the past year has devoted some of its activity to the donation of money to needy depot residents. At least monthly meetings must be held and in addition, an investigation of each case must be made by commitee members, according to the Chairman. The annual United Charities Drive at the Depot has been launched, with a goal of $6,000.00 to be reached by November 15. Colonel Paul N. Wickens has named Public Information Officer LeRoy F. Holst, right, as the drive's chairman. Ernest Schneider, the chairman of the 1952 drive, is at the left during the discussion of campaign plans. The drive is designed to combine fund raising for 12 charities in a single, concerted effort. This gives Depot employees an opportunity to make one gift to charity and the prerogative of choosing the particular ones of the 12 charities which they wish to be benefited. Members of the committee who will distribute pledge cards this week and next are Veryle Luke, Bernard Boltz, Eugene Carlson, Donald DuBois, Oscar Krebs, James Stewart, Glen Amy, Dale Snyder and Mrs. Helen B. Wing. Hoping For A Heat-Wave . . . 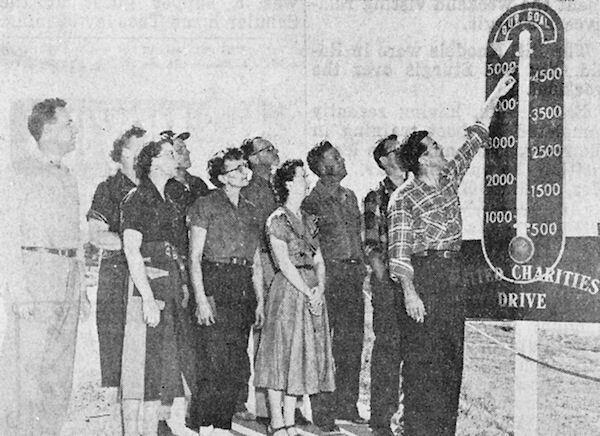 Looking at Igloo's theromometer, which shows a goal of $5000 for the 1954 United Charities Drive, is the UCD Committee. Pointing to the spot where members hope the mercury will be by November 3 is "Bud" Newlin, chairman of the committee. Other members are, left to right, front row: Bill Gaebler, Lena Gukeisen, Blanche Fryett, Shirley Kirby. Back row: Clara Kennaley, Marv Williams, Hugh Hutchison, Jim Stewart and Jim Anderson. 1958 United Fund Raising Campaign: William Seals, chairman; Sally Staley, Josephine Hutchinson, Lewis Gukeisen, Mrs. William Holt, Cecil Lund, Jack D. Lee, Ben Schock, Ed Hall, Don Thompson, Clair Jones and Felix Foss. With all pledge payments in this week, Homer Johnson of the Black Hills Ordnance United Fund Drive, announced a total of $1,435.50 raised for the local Community Fund, Girl Scouts, Boy Scouts and Red Cross. The Community Fund will receive $101.17, Girl Scouts $294.64, Boy Scouts $317.66 and the Red Cross $117.00.